Forbes has released its list of the 500 wealthiest people in the world and while there is a little juggling at the top, Bill Gates and Warren Buffet are still the richest men in America with a net worth of $53 and $47 billion respectively. That makes them the second and third richest people in the world. Who is the richest? According to Forbes, it is Mexican telecommunications king Carlos Slim, with a fortune estimated at $53.5 billion. Despite losing that top spot, the United States has more billionaires, 403 of them, than any country in the world. There is, however, a new #2 … China. China now has 64 billionaires, way up from the 28 it had in 2008. The richest man in China is Zong Qinghou, who runs the multi-billion-dollar soft drink firm Wahaha Group, and is ranked 103rd on the list with an estimated wealth of around $7 billion. More impressive is how fast these Chinese entrepreneurs have amassed their wealth. Five years ago there were only 100 people in China with a net worth of $150 million, but today there are more than 1,000. 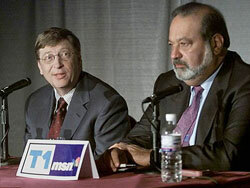 Carlos Slim (right) has surpassed Bill Gates (left) and Warren Buffet as the world’s richest person. China isn’t the only country in Asia that is sprouting billionaires. The number of Asian billionaires has increased from 140 in 2008 to 234 last year. There are 49 billionaires from India, 64 from China, 25 from Hong Kong, nine from Malaysia, seven Indonesians, four from Singapore, and two from Thailand. The wealthiest Chinese aren’t found in mainland China, however. The richest Chinese live and work in Hong Kong or Taiwan. You can invest side-by-side with these brilliant businessmen by investing in their companies. Investing with them could be as lucrative as buying stock in Microsoft or Berkshire Hathaway. Below is a list of those non-mainland Chinese billionaires, a brief description of their company, and the ticker symbol of their stocks on both the Hong Kong Stock Exchange and the U.S. over-the-counter market. Li Ka-shing ($21 billion): Li is the majority owner of Cheung Kong and Hutchison Whampoa (0013.HK or HUWHY.PK), which makes him the world’s largest operator of container terminals and world’s largest health and beauty retailer. He also owns the Canadian oil firm Husky Energy (HSE.TO or HUSKF.PK). Lee Shau Kee ($18.5 billion): Lee is the founder of Henderson Land Development (0012.HK or HLDCY.PK), a real estate development company he founded and one of the largest real estate companies in Asia. The Kwok Family ($17 billion): This is the clan behind the most prestigious real estate development companies in Hong Kong and China, Sun Hung Kai Properties (0086.HK or SUHJF.PK). Chen Yu-tung ($6.8 billion): Chen is the founder and majority shareholder of conglomerate New World Development (0017.HK or NDVLY.PK), a property development, infrastructure, transportation, retail, hotel, casino, brokerage and telecommunications companies in China and Hong Kong. Joseph Lau ($5.8 billion): Lau is the owner of Chinese Estate Group, a holding shell for his three companies: Chinese Estates Holdings (0127.HK or CESTF.PK), Chi Cheung Investment Company (112.HK) and G-Prop Holdings (0286.HK). NOTE: Chi Cheung and G-Prop are not listed in the U.S.
Terry Gao ($5.5 billion): Gao started Hon Hai Precision Industry (2317.TW or HNHPF.PK) in 1974 with $7,500 and turned it into one of largest contract electronics manufacturers in the world. India has fewer billionaires than China, but boy are they rich! Indian industrialists Mukesh Ambani and Lakshmi Mittal are among the world’s top five richest people. Indians Mukesh Ambani, with an estimated net worth of $29 billion, and Lakshmi Mittal, with $28.7 billion, are the fourth and fifth richest men in the world. But maybe you’re more of an ETF and mutual fund investor and you just want to hitch a ride of the overall Chinese market instead of investing alongside Chinese billionaires. While I’m quite sure you’ll be leaving a lot of potential profits on the table, you will be investing in the most dynamic and growing economy in the world. iShares FTSE/Xinhua China 25 Index ETF (FXI) owns the 25 largest and most liquid Chinese companies, so think of this as investing in the Dow Jones 30 Industrials of China. The top 10 holdings make up more than 60% of the fund so you will be heavily weighted with China Mobile. China Construction Bank, Industrial and Commercial Bank of China, China Life Insurance, and Bank of China. iShares FTSE China HK Listed Index (FCHI), is similar to FXI but only owns Chinese stocks that are listed on the Hong Kong Stock Exchange. It, too, is heavily weighted with financial stocks. SPDR S&P China (GXC) is managed by State Street and is also a large cap fund with emphasis on financials as well. PowerShares Golden Dragon Halter USX China (PGJ), isn’t as heavily weighted toward large cap financials. It owns a lot of energy (21%), technology (18%), and telecommunications (16%). Claymore/AlphaShares China All Cap (YAO) is very different from the above ETFs because of its focus on small caps. China is creating millionaires and billionaires faster than anyplace else in the world and I don’t expect that to change for years, perhaps decades. You, too, can participate in that phenomenal wealth creation by including a heavy dose of Chinese stocks in your portfolio. And where do you find those great Chinese stocks? The Forbes list is a great place to start because it isn’t just an interesting piece of news; it is also an investment map of some of the very best Chinese stocks you could own.